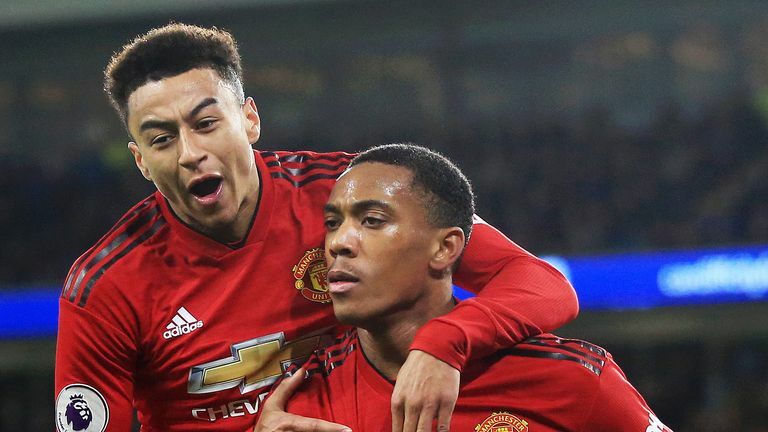 Manchester United boss Ole Gunnar Solskjaer says Anthony Martial and Jesse Lingard will be out injured for two to three weeks. Lingard pulled up shortly before half-time in the first leg of the last-16 tie against Paris Saint-Germain at Old Trafford with what appeared to be a hamstring injury. A three-week absence would see both players miss the Premier League game at home to Liverpool next Sunday, live on Sky Sports, and could even see both sit out the return leg against PSG on March 6. Solskjaer says Alexis Sanchez and Romelu Lukaku, alongside some of United's younger prospects, will get a chance to prove their worth during Lingard and Martial's spell out. He said: "It is a chance for anyone who plays, whether it is Alexis, Romelu or Angel (Gomes). "Anthony and Jesse have done really well for us, they are vital in the attacking parts with their pace. "Romelu and Alexis have different skill sets, so we just need to gel a team together for Monday now." The caretaker United boss was hoping to involve 17-year-old Mason Greenwood in the squad to face Chelsea but revealed the youngster has also been struck with an injury blow. "We were thinking Mason Greenwood now is your time to step in, but he's also injured unfortunately. He's out for a couple of weeks as well," Solskjaer said. "That's just how your luck sometimes goes, Mason will get his chance later on." Young duo Angel Gomes and Tahith Chong have been training with United's first team in recent weeks and Solskjaer says the pair now have a "big chance" of being involved against Chelsea on Monday. "It might be (time for Gomes or Chong to come in)," he added. "We still have forward options but Angel and Chongy have been training with us all week, even the weeks leading up to this, so there is a big chance they will be involved."